Through our horse assisted seminars, you learn to be more authentic, more intuitive, and to reflect on who you really are as a person. By connecting people with horses, I am really connecting you to your true self! Because they are 100% honest and, unlike a climbing wall or obstacle course, give you direct, immediate feedback. And they always give you another chance. You will walk away from the course with a lot to think about, new insights on how to maximise your full potential, and a great boast of self-esteem. After all, if you can get a 600kg animal to follow you, that's quite an achievment! The people around you will often not be completely honest about you – be it because they are afraid to tell the truth, don’t want to offend you, or simply because we have been taught to be polite. Horses on the other hand don’t care about a title on your business card, your degree or anything else from your past. They care about who you are today and now. Being a prey and herd animal, they are always looking for someone to trust and follow. Having been domesticated and around humans since centuries, they not only look for other herd members, but also look to us humans for assistance. But, they want congruent, authentic personalities. Who will a horse follow? They follow someone who knows where he wants to go. Someone self-confident, trustworthy and compelling. Someone charismatic, who can come up with solutions to the problems that arise in everyday life. A horse perceives a lot in the impact you have - fine nuances in body language, your emotions, and if you are honest to these emotions. If you mean one thing, but do another, you are irritating the horse, and it will show you. A horse needs you to be true to yourself in order to trust you. What is leadership? And what has it to do with horses? But, a horse is always open to reevaluate – so if you change your approach, and are honest to your believes, the horse immediately mirrors this. In our horse assisted seminars, you can test different approaches, and will receive immediate feedback every time you try something different or change your behaviour. This allows for extremely fast learning experiences. And because our courses are about letting your experience and feel the influence you have on others, what you take away from them is a lot more powerful and effective. During the courses we alternate between practical exercises in the riding arena as well as short theoretical sessions with a video analysis and discussions how to transfer the experience from the horse exercises into everyday life. The course includes lunch and coffee breaks, and currently takes place either in Dubai during the cooler months, or in Abu Dhabi where we can use an indoor arena once it gets warmer. On request these Horse Assisted Seminars can also take place in the surrounding countries, or anywhere else due to our worldwide network of Licensed HorseDream Partners! No prior horse experience is required. 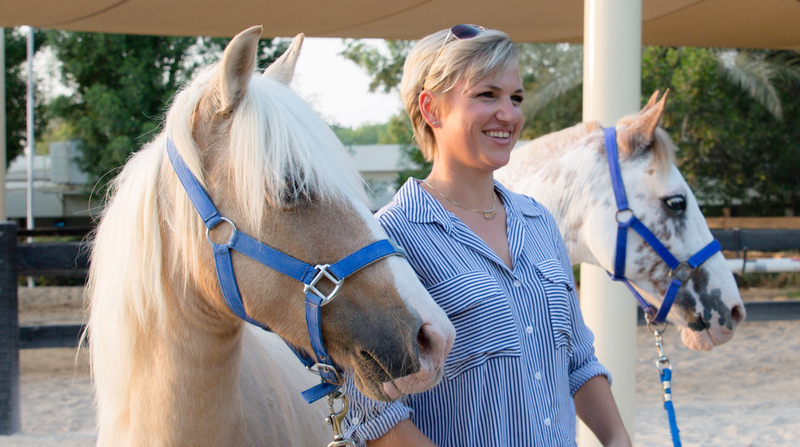 Contact me for a short meet and greet with the horses in the stable, either in Dubai or Abu Dhabi. Get introduced to them and let the horses convince you!